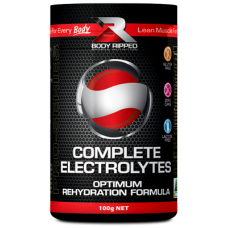 All-new Body Ripped COMPLETE ELECTROLYTES Optimum Rehydration Formula is the most powerful and complete electrolyte formula available. It is an easy to use, full spectrum electrolyte and vitamin blend, designed to accelerate cellular hydration and speed up post-workout recovery. 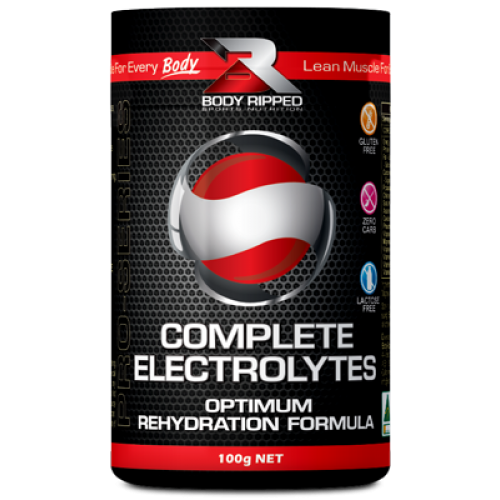 Body Ripped COMPLETE ELECTROLYTES was developed to greatly assist with rehydration, speed up post-workout recovery, reduce muscular cramps, promote muscle growth and repair, and greatly improve sports and training performance. Each serve of COMPLETE ELECTROLYTES contains a comprehensive blend of electrolyte salts, as well as added vitamins. This blend is specifically formulated to match the body’s own mineral and electrolyte balance, and to maximise its utilisation and absorption. COMPLETE ELECTROLYTES is gluten-free, lactose-free, and contains no carbs. It can be added to plain water or any beverage, and can be used at any time of the day. For best results, adults take COMPLETE ELECTROLYTES before, during, and/or after exercise. Potassium Chloride, Sodium Bicarbonate, Di-calcium Phosphate, Magnesium Aspartate, Vitamin C, Vitamin B12, Vitamin A, Vitamin K, Vitamin D.